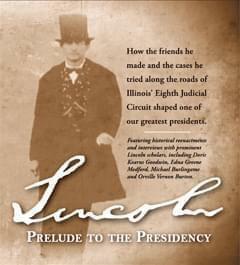 As a lawyer traveling Illinois’ Eighth Judicial Circuit, Abraham Lincoln made two simultaneous journeys. He gained respect as a skilled attorney and mesmerizing speaker, but he also built a political base and refined his views on the important issues of the day, many of which he would face in the White House. His experiences from 1837 to 1860 on muddy roads, in homes of friends and in courtrooms on the circuit guided him when he became president. WILL-TV’s Lincoln: Prelude to the Presidency tells the story of the cases he tried and people he met during this critical period of his life. Reenactments of Lincoln as you’ve never seen him before: defending a slaveholder trying to reclaim a slave named Jane Bryant and her children; brandishing a sword on the banks of the Mississippi River at dawn before being talked out of fighting a duel; and crossing the prairie reading a book atop his horse, Old Tom. Interviews with experts, including Doris Kearns Goodwin, Edna Greene Medford and Orville Vernon Burton, who describe how the circuit built the skills Lincoln used as president. Lincoln: Prelude to the Presidency was made possible by contributions from the Illinois Abraham Lincoln Bicentennial Commission; Country Financial; the University of Illinois College of Law; the Monticello Chamber of Commerce; the Office of the Chancellor, University of Illinois at Urbana-Champaign; the Illinois State Bar Association and the Abraham Lincoln Presidential Library & Museum.